The North America aesthetic services market is prophesied in a report by Transparency Market Research (TMR) to remain highly competitive for the next few years. Players could look to invest for achieving technological advancement and focus on product innovation. Talking about technological advancement, development of minimally invasive procedures is a good instance to follow. The market witnesses the presence of top players such as Riverchase Dermatology and Cosmetic Surgery, Advanced Dermatology & Cosmetic Surgery, and Dermatology Solutions Group. TMR anticipates the North America aesthetic services market to be valued at a US$28.1 bn by the completion of 2024 while posting a 7.7% CAGR during the forecast tenure 2016-2024. By end user, dermatology clinics and cosmetic centers could exhibit a prominent CAGR of 8.6%. In 2016, the U.S. earned maximum revenue of US$14.7 bn. The country is expected to continue raking in a larger amount of revenue in the coming years. There could be a number of factors working in the favor of the North America aesthetic services market. Availability of user-friendly products and rising demand from men besides women are foreseen to improve the growth of the market. Players could cash in on technological developments of energy-based aesthetic devices to secure a strong position in the market. Rising awareness about cosmetic procedures among consumers could be another factor helping with market growth. Expanding geriatric population and swelling adoption of minimally invasive procedures are projected to augur well for the market. High preference for less painful treatments and those with shorter hospital stay is foretold to bring in good prospects in the market. Demand for liposuction procedure ensued from worrying increase in obese population could also turn the focus to aesthetic services. 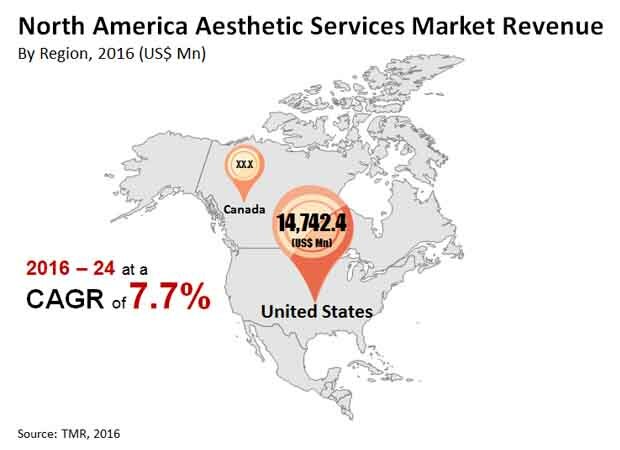 The North America aesthetic services market is expected to gather pace in the near future. However, there could be a few factors arresting its growth. Reduced focus on the development of devices for treating dermatological conditions and tight safety regulations could hamper the demand in the market. Nonetheless, high incidence of skin diseases, increasing improvement of healthcare and medical infrastructure, and rising awareness among consumers, especially in the U.S. are forecasted to create ample of opportunities in the market. Demand for removal of unwanted fat and skin tightening amid the emergence of innovative mechanical devices for non-invasive procedures could bode well for the North America aesthetic services market. Recently, there has been a telling demand for facial contouring and breast enhancement witnessed in the region.